Beautiful and makes beautiful toast! works so easily, like a drawer. To make your toaster gift breath-taking, Proctor Dealers are offering a beautiful tray set, worth $9.95…together with the $22.00 DeLuxe Proctor Toaster, both only $25.95 . . . with the $15.95 Proctor Toaster, both only $19.95. 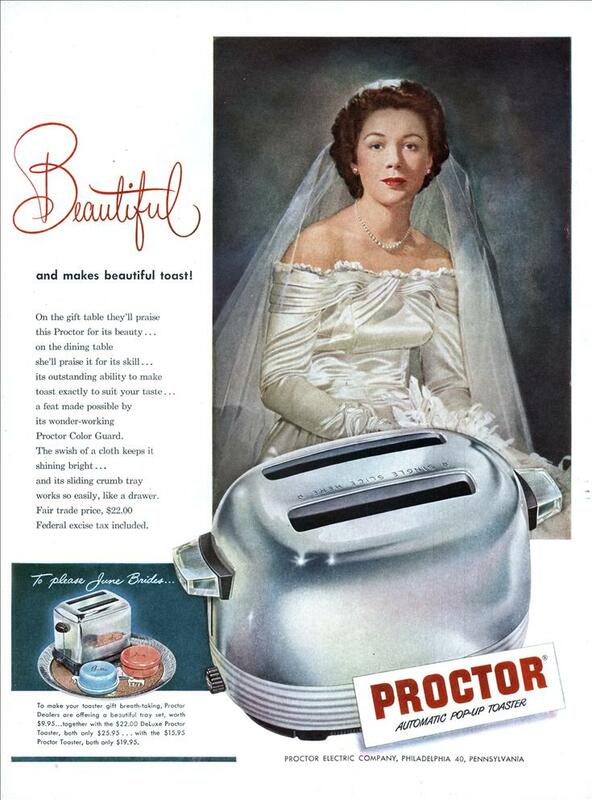 Hey I see the subtle hint in this ad, buy the toaster set as a wedding present. Those sneaky advertisers! I thought it meant the wife should be making toasted sandwiches as soon as she gets married. I was just in Home Depot picking up some screws; they had a Proctor-Silex toaster there for $17.99. Of course, it didn’t come with a wedding dress. I always thought the one slice slot was a “recent” idea. My wife and I received a chrome electric percolator as a wedding gift. She hates coffee and I never make more than one cup at a time. I don’t know what ever happened to that thing, but it would probably be a collectable now.